estimates of average collectively agreed annual working time. the differing roles of collective bargaining and legislation, with legislation having an impact on actual hours in some countries, but acting only to set a maximum ‘safety net’ in others. Figures for normal weekly working hours are also problematic when we compare working time between countries, as these do not take into account factors such as overtime, the length of annual and other forms of leave, or (topically at present) the use of short-time working. This report differs from previous editions in the series in the method it uses for calculating averages for the groups of EU Member States (EU27, EU15 and NMS12). The average figures provided this year for these country groupings are weighted in order to reflect the relative country sizes in terms of persons aged 15 to 64 who are employed full time, according to the Eurostat’s Labour Force Survey (LFS). By contrast, in previous editions, simple averages were calculated for the country groupings. Collective bargaining plays an important role in determining the duration of working time in most of the countries, though to a lesser or sometimes negligible extent in some of the new Member States (NMS) that joined the EU in 2004 and 2007. However, the nature and extent of this role differs widely between countries, with bargaining at different levels (intersectoral, sectoral, company, etc.) playing different roles, and bargaining coverage varying considerably (in general, being higher in the EU15 than in the NMS). Moreover, the importance of bargaining differs greatly between sectors of the economy and groups of workers. The relationship between bargaining and legislative provisions on working time also varies between countries. Figure 1, below, depicts the average collectively agreed normal weekly hours in the EU27 plus Norway in 2010. In most cases, the figures are estimates; however, in some they refer to previous years and therefore should be used with caution (see notes to Figure 1, in Annex 1). In the majority of countries, average agreed hours in 2010 were identical to those in 2009 (TN1004039S). Among the few exceptions, Slovakia was the only country to record a decrease (of 0.1 hours), which refers to the collectively agreed weekly hours for single-shift work. The other exceptions were Spain, Sweden and the UK. Spain and the UK registered increases of 0.2 hours per week while in Sweden the increase was only of 0.1 hours. France remains the country with the shortest average collectively agreed working week, of 35.6 hours. This most likely reflects the effects of the Aubry law establishing a statutory working week of 35 hours since 2000 (FR0001137F). The Nordic countries, together with the UK and the Netherlands follow, each registering an agreed normal working week below the EU15 average of 37.6 hours in 2010. Notes: the data should be interpreted in conjunction with the notes in Annex 1; EU27, EU15 and NMS12 figures are authors’ own calculations of weighted averages based on relative country sizes in terms of employment (Eurostat, LFS, 2010). All groups of countries registered a very slight increase in the agreed weekly hours in 2010, following the increase already registered between 2008 and 2009. 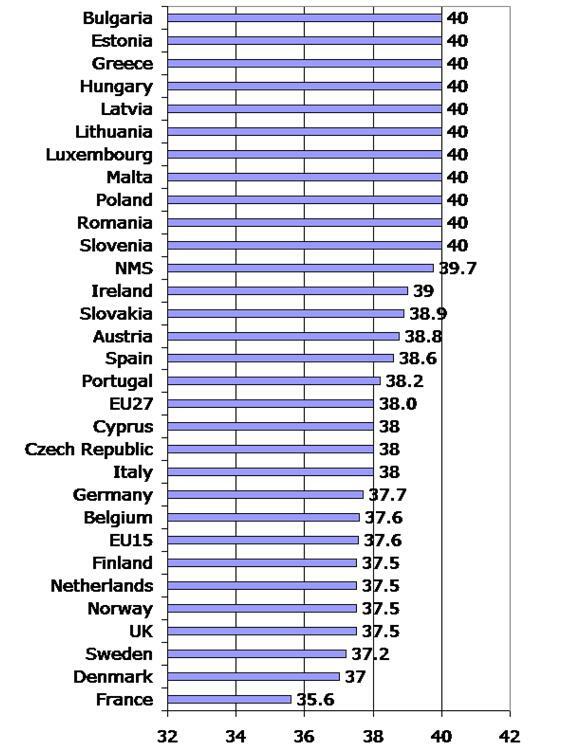 The average in the EU15 stood at 37.6 hours, an increase of 0.1 hours in relation to 2009. Across the EU27, the average agreed weekly hours stood at 38 hours, an increase of 0.1 hours in relation to the 37.9 hours registered in the previous year. In the NMS, the agreed weekly hours remained at 39.7 hours a week, which means that the gap between older and newer Member States was slightly reduced from 2.2 to 2.1 hours in 2010. In most of the NMS, collective bargaining does play an important role in the setting of weekly normal working hours. For that reason, the figures for Bulgaria, Estonia, Hungary, Latvia, Lithuania, Malta, Poland, Romania and Slovenia correspond to the 40-hour normal working week that is legally set. 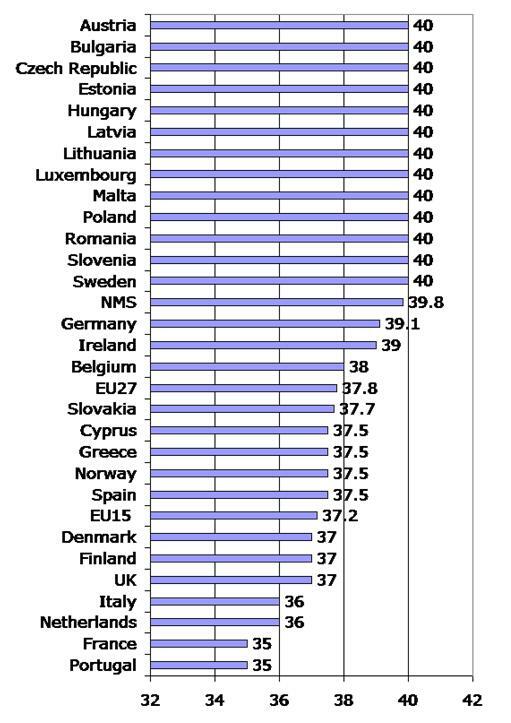 Only in Cyprus, Czech Republic and Slovakia are shortened normal working weeks (of below 40 hours) are agreed; no changes occurred between 2009 and 2010. The following sections deal with the average normal weekly working hours for full-time workers as set by collective bargaining in three sectors that represent manufacturing industry, services and the public sector – metalworking, banking and local government. While the more specific sectoral figures below are probably more accurate than the overall average data given in the previous section, caution is again advised in their use. The notes related to each figure must be taken into account for correct interpretations; all the caveats noted above also apply to the sectoral data. The manufacturing sector together with the local government sector recorded the longest average agreed normal weekly working hours with 37.8 hours, followed by the banking sector with 37.4 hours. The agreed weekly working hours are higher in the NMS than in the EU15 in all three sectors. The largest gap can be found in the banking sector, in which the normal agreed working week in the NMS is 3.1 hours longer than in the EU15. The gap is of 2.7 hours and 2.4 hours respectively in the local government and the metalworking sectors. In most of the NMS there is a uniform 40-hour working week, which corresponds in general to the statutory normal week in those countries; this is the case in Bulgaria, Estonia, Hungary, Latvia, Lithuania, Malta, Poland, Romania and Slovenia. Other countries also have uniform agreed weekly working hours across the three sectors, though these are shorter (39 hours in Ireland, 37.5 hours in Norway and 37 hours in Denmark). Relatively little variation exists in Austria, Cyprus, the Czech Republic, Finland, France, Luxembourg, Slovakia and Sweden, countries in which none of the three sectors examined differ by more than two hours. Wider sectoral differences exist in Belgium, Germany, Greece, Italy, the Netherlands, Portugal, Spain and the UK. Figure 2 shows collectively agreed normal weekly working hours in the metalworking industry in 2010, based on relevant sectoral collective agreements, except where specified otherwise in the notes relating to the figure (see Annex 2). Virtually no change was reported from the 2009 hours in most countries, with the exception of very modest decreases in France and the UK (of 0.1 hours) and modest increases in the Czech Republic and Slovakia (of 0.1 hours). Spain is the only country that recorded a more substantial increase, of 0.4 hours in metalworking (the figure for Spain corresponds to divisions 24 to 30 of NACE, rev. 2). It is worth noting that in the Czech Republic and Slovakia the agreed normal weekly working hours in 2010 returned to the levels registered in 2006 (37.8 hours, and 38 hours, respectively), after shorter weekly hours had been agreed between 2007 and 2009. In the EU27, the average agreed normal working week in the metalworking industry was 37.8 hours, which is slightly lower (by 0.2 hours) than the average for the whole economy. Although no change occurred between 2009 and 2010, this figure represents an increase of 0.1 hours per week in comparison with the average registered in 2008, the last time EIRO examined the agreed working time in the sector. The change in the EU15 was slightly different: a modest increase in the agreed working work had been recorded between 2006 and 2008, from 37.1 to 37.2 hours. There was no change in 2009; then, in 2010, the agreed working week extended again, this time by 0.1 hours to 37.3 hours. The agreed working week in metalworking is significantly longer than in the whole economy in Sweden (where it is 2.8 hours longer), Italy (2 hours longer) and Portugal (1.8 hours). In contrast, the agreed working week is shorter in metalworking than in the whole economy in Germany (where it is 2.7 hours shorter) and Luxembourg (1.8 hours). Overall, and contrary to what was reported in 2008, the agreed working week in 2010 in metalworking in the EU15 is lower than for the whole economy by 0.2 hours. In 2010, France remains the country with the shortest agreed working week in the sector, at 35.6 hours. In the NMS, the agreed weekly working hours have been almost constant over the last five years. After a slight decline to 39.5 hours (recorded in 2008), the average agreed working week remained stable at 39.6 hours in 2009 and 2010. Across the NMS, virtually no changes were recorded – except in the Czech Republic and Slovakia, countries in which the agreed working hours in the metalworking sector increased modestly (by 0.1 hours). In most of the NMS, the agreed weekly working hours in metalworking are the same as the national average: again, the Czech Republic and Slovakia are the exceptions, each having an average working week that is shorter than the average for the entire economy. Note: the data should be interpreted in conjunction with the notes in Annex 2; EU27, EU15 and NMS figures are the author’s own calculations of weighted averages based on relative country sizes in terms of employment (Eurostat, LFS, 2010). Figure 3 shows the collectively agreed normal weekly working hours in the banking sector in 2010, based on relevant sectoral collective agreements, except where specified otherwise in the notes relating to the figure (see Annex 3). There were practically no changes recorded across Europe between 2009 and 2010, with the exception of Spain (a decrease of 1.7 hours) and the Czech Republic and Slovakia (slight decreases). France was the only country registering an increase, although this was almost negligible: around 0.05 hours. In the EU27, the average agreed normal working week in banking was 37.4 hours; this is 0.6 hours shorter than the average for the whole economy. This figure represents a decrease of 0.2 hours compared with 2009. Moreover, it falls below the average agreed working hours in the sector recorded in 2006 (37.5 hours per week). In the EU15, after an increase from 37.5 to 37.7 hours between 2006 and 2008, the agreed weekly working hours declined again to 36.6 hours (a drop of 0.4 hours) in 2010. Portugal, Belgium, France, the UK and Spain have the shortest agreed working weeks in banking, where the working week varies between 35 and 35.3 hours. Considering only those countries in which the agreed working weeks in banking differ from the statutory weekly hours, the Czech Republic, Germany, Austria and Sweden have the longest working weeks (more than 38.5 hours). Overall, the average agreed working week in banking in the EU15 is one hour shorter than for the whole economy. In the NMS, after an increase of 0.1 hours in relation to 2006, the average collectively agreed working week has remained unchanged at 39.9 hours since 2008. It is worth noting that the average agreed working hours in this sector have been consistently slightly longer than for the entire economy, with a difference of 0.2 hours being recorded in 2010. The differences between the average for the NMS12 and those for the EU27 and EU15 have also persisted and, indeed, increased. In 2009, the working week in the banking sector was 2.2 hours longer in the NMS than the average for the EU27, and 2.9 hours longer than the average for the EU15. In 2010, those differences had increased, to 2.5 and 3.3 hours, respectively. Cyprus continues to stand out as the country among the NMS with the shortest agreed working hours in banking (37 hours). Note: the data should be interpreted in conjunction with the notes in Annex 3; EU27, EU15 and NMS12 figures are the authors’ own calculations of weighted averages based on relative country sizes in terms of employment (Eurostat, LFS, 2010). Figure 4 shows the collectively agreed normal weekly working hours in the local government sector in 2010, based on relevant sectoral collective agreements, except where specified otherwise in the notes relating to the figure (see Annex 4). There were no changes across the EU27 and Norway between 2009 and 2010. The average agreed normal working week in local government was 37.8 hours in the EU27, 37.2 hours in the EU15 and 39.8 hours in the NMS. In the EU15 and the EU27, the average agreed working week is, respectively, 0.4 and 0.2 hours shorter in local government than the average for the whole economy. It is 0.1 hours longer in the sector than for the whole economy in the NMS. The gap between the NMS and the other country groupings persisted between 2009 and 2010: in the NMS, the working week was 2.7 hours longer than in the EU15 and 2.1 hours longer than in the EU27. However, in the local government sector, not all EU15 countries have shorter working weeks than the NMS. In Austria, Luxembourg and Sweden, the working week in 2010 was 40 hours: this is longer than the average agreed in the sector in the NMS. 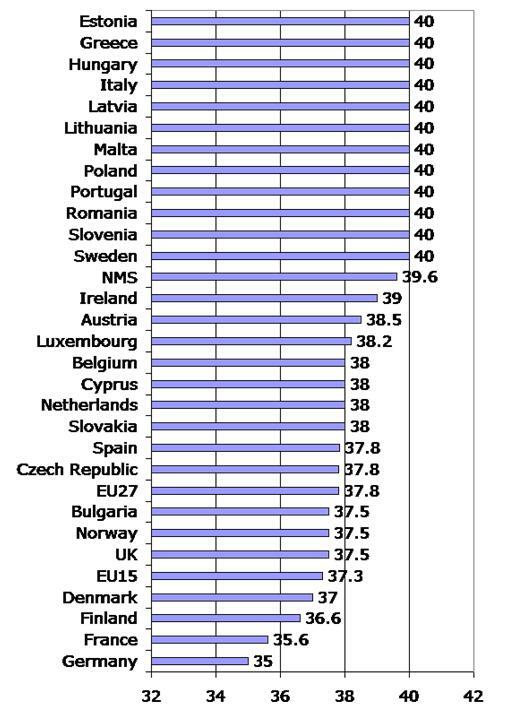 Conversely, the NMS countries of Cyprus and Slovakia had working weeks of 37.5 hours and 37.7 hours, respectively – shorter than the average for the EU27. France and Portugal (with 35 hours per week), together with Italy and the Netherlands (with 36 hours), remained the Member States with the shortest collectively working weeks in the local government sector. Note: the data should be interpreted in conjunction with the notes in Annex 4; EU27, EU15 and NMS12 figures are the authors’ own calculations of weighted averages based on relative country sizes in terms of employment (Eurostat, LFA, 2010). a daily hours limit of eight hours for night workers. As Table 1 shows, the countries can be divided in two groups: those that set their maximum weekly hours at the 48 hours specified in the Working Time Directive, and those that operate a lower limit of 40 hours (38 hours in the case of Belgium). There was little change in this regard between 2010 and 2009. Notes: * In Germany, there are no provisions for a statutory maximum working week: the figure presented is calculated from the statutory maximum of eight hours a day. In the first, larger group of 16 countries, the statutory 48-hour maximum is in excess of average collectively agreed weekly working hours (see Figure 1), and of average actual weekly hours (see Figure 5) and appears to operate essentially as a safety net. It should be noted that the 48-hour figure in these cases includes overtime. As permitted by the Working Time Directive, a number of countries allow for individual workers (generally or only in specified sectors) to ‘opt out’ of the 48-hour weekly maximum (this the case, for instance, in Malta and the UK). In the second group of 12 countries, the statutory maximum is much closer to average agreed or actual or usual weekly hours and is identical to agreed hours in some cases, indicating a more active role for the law in governing working time. However, overtime is not included in this figure, and the ‘maximum’ may function in practice as a statutory normal working week. Such statutory normal weeks also exist (at a lower level than the maximum working week) in some countries with a 48-hour maximum, such as the Czech Republic, France, Lithuania, Luxembourg, Norway and Poland. The statutory maximum figures given in Table 1 may be exceeded in many countries where working time flexibility schemes allow weekly hours to be varied around an average over a reference period, as permitted by the Working Time Directive. Weekly maximum working time under such hours-averaging schemes may itself be subject to a ceiling, such as 60 hours. To take one example, in the Netherlands, weekly working time – including overtime – may not exceed 48 hours on average over a 16-week reference period, or 55 hours per week on average over a four week reference period, unless otherwise agreed by the employer and trade union or works council, subject to an absolute weekly limit of 60 hours. The complexity of most countries’ rules relating to overtime, variable working time, etc., means that genuine comparisons cannot be made between the maximum hours set out in Table 1; moreover, there may not be great differences between the groups of countries with maximum weeks of 40 and 48 hours. ten countries stipulate 8 hours. Regarding weekly limits, whether or not overtime is included differs between countries, and daily hours may often be longer in the context of working time flexibility schemes, as the following examples show. In Bulgaria, the working day may be extended from 8 to 10 hours, but only for a total of 60 working days a year and for not more than 20 consecutive working days. In the Czech Republic, daily hours may be extended from 9 to 12 hours under working time flexibility schemes, within a defined reference period. In Germany, a working day may be extended to 10 hours as long as an 8-hour average is maintained over a 24-week or 6-month reference period. In Spain, daily working time may be as high as 12 hours, by agreement, as long as the 9-hour average is maintained over a defined reference period. The data presented above relate to collectively agreed normal weekly hours. To obtain a more accurate picture of how many hours workers really work in a given week, we must turn to statistics on actual weekly hours worked. These are typically measured in labour force surveys, which include factors such as overtime and absence. Figure 5 shows harmonised Eurostat figures for the ‘average number of actual weekly hours of work in the main job’ of full-time employees in 2010, based on its Labour Force Survey (LFS). These hours include all hours, including extra hours, whether paid or not. Notes: According to Eurostat, the ‘actual hours worked’ in the reference week are the hours the person spent in work activities during that week. Work activities should include production activities, ancillary activities, short pauses and education and training necessary for successfully carrying out their tasks. Actual hours worked exclude travel time between home and the place of work, main meal breaks, and absences from work within the working period for personal reasons and education and training hours not necessary for carrying out the job tasks. Note: Average number of actual weekly hours of work in main job, full-time employees, NMS average calculated by EIRO. In the EU, full-time employees in Romania worked the longest actual weekly hours in their main jobs in 2010 – 41.3 hours. They were followed by employees in Luxembourg, the UK, Poland, Germany, Bulgaria, Estonia and the Czech Republic. Employees in Finland worked the shortest hours – 37.8 hours. This was 3.5 hours more than their counterparts in Romania, giving Romanians a working week that was longer by 9.24%. Eleven of the 12 NMS had actual weekly working hours at or above the EU27 average of 39.7 hours, compared with only five of the EU15. Only Slovakia had an actual working week that was shorter than the EU27 average (39.4 hours). In the EU15, the longest actual full-time hours were worked in Luxembourg, the UK and Germany, and the shortest in Ireland, France and Finland. by three hours in the UK. In the EU27, the actual working week 39.7 hours in 2010; this was 1.7 hours more than the agreed working hours. In the EU15 the working week was 39.4 hours, 1.8 hours more than the agreed hours. In the NMS, the working week was 39.9 hours, 0.2 hours longer than the agreed working hours. The annual figures for actual weekly working hours in the EU for the last five years indicate that 2010 marked a reversal of the downward trend recorded between 2006 and 2009. In both the EU27 and the EU15, the actual working week was 0.2 hours longer than in 2009, while in the NMS it was 0.15 hours longer. 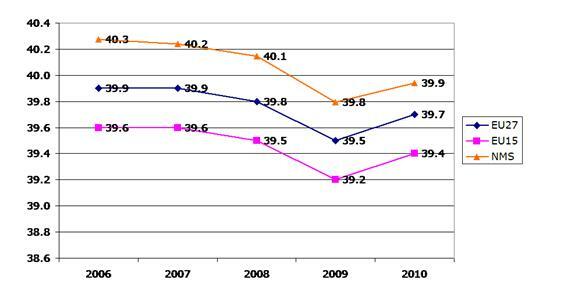 These, of course, are averages: the change between 2009 and 2010 varied between Member States. It is possible to distinguish three groups of countries. In Latvia, Malta and Spain, actual working hours decreased in 2010 (by between 0.1 and 0.6 hours). Austria, the Czech Republic, Lithuania, Luxembourg, Romania, Slovenia and the UK (and the non-EU country, Norway) did not show any changes. In Belgium, Bulgaria, Cyprus, Denmark, Finland, France, Germany, Greece, Hungary, Ireland, Italy, the Netherlands, Poland, Portugal, Slovakia, Spain and Sweden, very modest increases of between 0.1 and 0.7 hours were recorded. In Estonia, meanwhile, full-time employees actually worked 1.1 hours more per week on average in 2010 than they did in 2009. Along with this general upward trend, the gap between agreed and actual hours widened again in 2010, reversing the trend observed between 2008 and 2009. This might be partially explained by a less extensive use of short-time working schemes than in the previous years. In 2010, actual weekly hours worked by male full-time employees in their main jobs continued to exceed those of their female counterparts in all countries considered. Across the EU27, men worked on average 2.1 hours more than women. The gap is wider in the EU15 than in the NMS. In the EU15, men work 2.3 hours more per week than do women; by contrast, in the NMS, men work only 1.5 hours more than women. Again, these averages conceal more stark national situations: men’s actual weekly hours exceeded women’s by three hours or more in Estonia, Greece and Sweden, and by less than one hour in Belgium, Ireland, Italy and Portugal. the collectively agreed rules on leave entitlement being too complex to enable even a rough estimate to be produced. In Belgium, for example, sectoral agreements may provide for a general addition of up to five days to the statutory minimum annual paid leave of 20 days. Such agreements may also provide for additional days of leave after a certain period of service – one extra day after 10 years’ service, for instance. Further additional days of leave may also be given as compensation for workers with a normal weekly working time above the sectoral norm. Slovenia is another country where seniority and other criteria add to the minimum entitlement of 20 days in ways that make an average impossible to estimate. Notes: The figure should be read in conjunction with the notes in Annex 5. The average annual leave entitlement across the EU27 and Norway (for those countries for which data are available) is 25.4 days. For nine of the countries in the EU15, the average is 25.6 days. Agreed annual leave entitlement in the EU15 varies from 30 days in Denmark and Germany, 25 days in Finland, France, the Netherlands (and Norway), to 24.6 days in the UK and 24 in Ireland. Among the NMS, figures are available only for the Czech Republic, Cyprus, Estonia, Slovakia and Romania, where the average collectively agreed paid annual leave is 24.1 days. 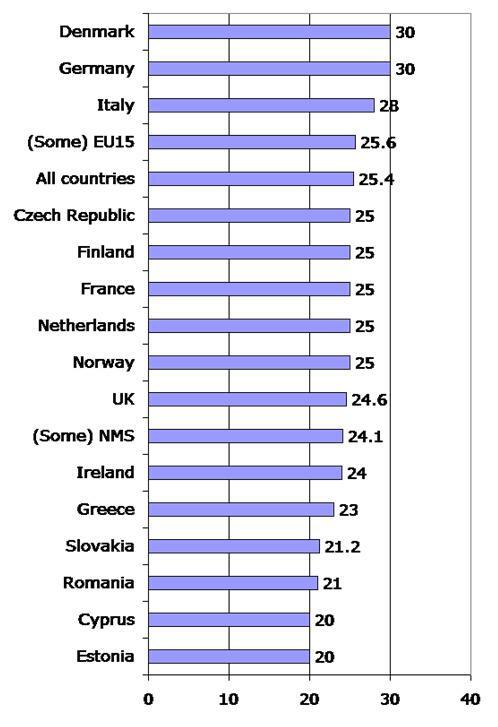 Among these countries, agreed leave is highest in Czech Republic with 25 days – and between 20 and 21.2 days in the other countries. All 28 countries studied have a statutory minimum period of paid annual leave, as set out in Table 3. In the table, the leave is expressed in days and harmonised on the basis of a five-day working week. The number of days represent only the basic entitlement, since entitlement increases with length of service in some countries. 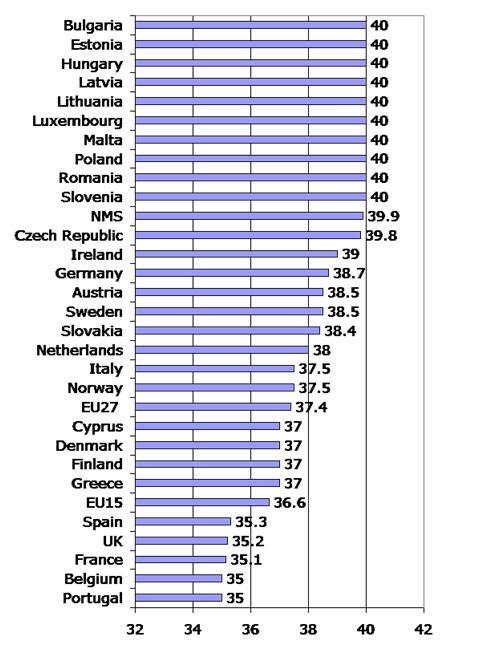 The majority of countries, 18 out of 28, have a 20-day minimum entitlement as laid down in the EU Working Time Directive. This group includes all the NMS except Malta. Five countries have a 25-day minimum – Austria, Denmark, France, Luxembourg and Sweden – while the entitlement is 24 days in Malta, 22 in Portugal and Spain, and 21 in Norway. The UK increased its statutory entitlement from 20 to 28 days over the period 2007–2009. However, this includes eight public holidays, and the increase was designed to end some employers’ practice of counting those days as part of workers’ statutory entitlement. As a result, actual UK statutory annual leave entitlement might perhaps more properly be considered to be 20 days. Notes: This table should be read in conjunction with the notes in Annex 6. Average collectively agreed annual leave exceeds the statutory minimum by four days or more in Germany, the Netherlands, the Czech Republic, Denmark, Finland, Ireland, Norway and the UK (if statutory entitlement in the UK is taken as 20 days), suggesting that the law acts essentially as a safety net in these countries. Average collectively agreed annual leave and the statutory minimum are the same in Cyprus, Estonia and France. In Greece, Italy, Romania and Slovakia, the agreed annual leave exceeds the statutory minimum by between one and three days. Collectively agreed annual working time figures are available from national sources for a limited number of countries, as presented in Table 4. These may provide a more accurate measure of the duration of working time as they, being established for the whole year, take into account factors such as leave, holidays and flexibility arrangements. In order to arrive at a crude annual estimate for collectively agreed annual normal working time in all countries for 2010, the figures are taken for the average collectively agreed normal weekly hours (see Figure 1) and a five-day working week throughout the 52 weeks of the year has been assumed. be impossible to calculate owing to the complexity of the rules or a lack of current data). Use of the statutory minimum leave in calculating collectively agreed annual normal working time thus makes the total figure rather higher than is in fact the case, rendering the estimates for these countries particularly crude. The number of annual public holidays is also subtracted (excluding those falling on Sundays). Where there are varying numbers of regional public holidays (as in Germany), an attempt has been made to give a mid-range figure. It should also be noted that additional holidays may be observed locally or on the basis of collective agreements or custom, while the number of public holidays may vary from year to year, especially in countries that do not award a substitute holiday when a public holiday falls at the weekend. These variations are the main source of year-on-year changes in annual hours in many countries. The resulting annual figures do not, of course, take into account factors such as overtime working, other forms of time off and leave, or short-time working. They are only very rough estimates, but they allow some broad observations to be made (see Table 5). In 2010, in the EU27, average collectively agreed annual normal working time was 1,714.9 hours. In the EU15, it was 1,686.4 hours, and in the NMS, 1,829.6 hours. Workers in the NMS thus work, on average, 143.2 hours a year (around 8.5%) longer than their counterparts in the EU15 – the equivalent of over 3.5 working weeks. 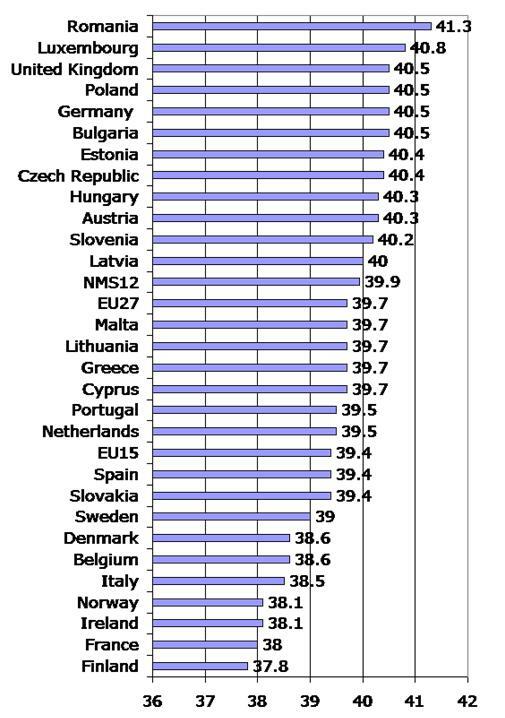 However, in two of the NMS (the Czech Republic and Cyprus), annual working time is around the average for the EU27. Overall, the EU’s longest hours are worked in Romania, Poland, Bulgaria, Estonia, Hungary, Latvia and Lithuania, while the shortest are worked in France, Denmark, Germany, Sweden, Italy and Finland. Employees in Romania, on average, work 263.4 hours more (around 16.4% more, or around 6.5 Romanian working weeks) than their counterparts in France. Looking at the ranking of the 28 countries in terms of the length of their agreed working hours, the countries with the longest and shortest weekly hours are generally also those with the longest and shortest annual hours. However, the annual perspective results in rather different rankings for some countries than those provided by the figures for weekly hours. Some countries, such as the Czech Republic, Italy and Malta, have a lower position in the ‘league table’ for normal annual hours than in the table for normal weekly hours (in other words, their hours are shorter) because of the effects of relatively long annual leave and/or a relatively high number of public holidays. Conversely, hours are longer in other countries, placing these countries higher in the table for normal annual hours than in the table for normal weekly hours because of the effects of a relatively low number of public holidays and/or relatively limited annual leave. Countries in this category include the UK, the Netherlands and Belgium; in the latter, however, the annual leave figures used are for minimum statutory leave due to an absence of data on agreed leave. The number of public holidays (excluding those falling on Sundays) varied in 2010 from 14 in Spain to 5 in the Netherlands. The average figure of public holidays in the EU27 was 9.6, with the NMS having on average fewer days (8.7 days) than the EU15 (9.9 days). The combined total of agreed annual leave and public holidays varied in the EU from 40 days in Germany and Denmark to 27 days in Romania – a difference of around 48% or 2.5 working weeks. Other notably high-leave countries include Italy and Malta (with 37 leave days), while other notably low-leave countries include Bulgaria, Estonia, Hungary and Slovenia with 29 days. The average figure for the EU27 was 34.4 days – 35.7 days in the EU15 and 29.6 days in the NMS. Notes: * Statutory annual leave has been used, since figures on average collective agreed annual leave are not available. The data in Figure 1 should be read in conjunction with the following notes. Austria – Estimation on the basis of the most important collective agreements that in general provide for a 38.5 to 39 hours a week. Belgium – The figure is an estimate calculated by the Federal Public Service for Employment, Labour and Social Dialogue. The calculation takes into account (only) the provisions of sectoral collective agreements in the private sector. These agreements cover a very high proportion of the private sector, but not all the employees. For example, the company agreements of state enterprises, such as railways or postal services, are not included. These sector agreements can furthermore be amended by company agreements (such as working time reduction or alternative working time regimes). A final important element in this debate is that managerial staff (kaderleden/cadres) are most of the time not bounded by Belgian working time rules and legislation. The Federal Public Service| normally publishes not the exact figure, but an index, separately for blue-collar and white-collar workers. For both categories this index has remained unchanged since the beginning of 2003. Bulgaria – No average data for collectively agreed normal weekly working time. The average actual working week is 40.2 hours for full-time workers (Source: NSI, Labour Force Survey). Cyprus – 38 hours; Source: Cyprus Labour Institute (INEK-PEO). Czech Republic – 37.3 to 39.6 hours, according to the working time arrangements; source used is the Information System on Working Conditions (ISWC). Working time arrangements: single shift operation (39.6 hours/week), two-shift operation (38.30 hours/week), operation on three shifts (37.4 hours/week ), continuous operating (37.3 hours/week). Denmark – Estimation based on weekly working hours provided by almost all collective agreements. Estonia – The 40-hours working week is legally established; working time reductions are usually not included in collective agreements. Thus, the figure used is based on statutory working time. Finland – The figure is an estimate, based on typical provisions of sectoral agreements. France – the figure is from the Ministry of Labour’s Directorate for Research, Studies and Statistics (Direction de l’animation de la recherche, des études et des statistiques, DARES); it refers to average collective weekly working hours, December 2010. Greece – figure refers to most collective agreements. Hungary – collective agreements usually reiterate the statutory working week of 40 hours; although the Labour Code allows collective agreements to stipulate a shorter period, in practice deviations from the statutory hours are relatively rare. Ireland – figure is an estimate based on most collective agreements. Italy – figure represents an estimate based on the range 36–40 hours per week provided in collective agreements. Netherlands – figure from Labour Inspectorate’s review of collective agreements; no changes have been registered since 2007. Norway – figure represents ‘normal working hours’ for employees covered by collective agreements; employees working shifts or at nights work fewer weekly hours. Malta – figure is an estimate based on the fact that, while no statistical data exist, most collective agreements specify a normal weekly working time of 40 hours. Portugal – figure from the employment survey of the Ministry of Labour and Social Solidarity’s Office of Strategy and Planning (GEP) (formerly the General Directorate for Studies, Statistics and Planning, DGEEP); the figure is for 2006 and refers to ‘normal average working time’ (no more recent data are available). UK – data for collectively agreed working hours and annual leave entitlement are from two surveys conducted by Incomes Data Services (IDS): the ‘Hours and holidays 2009’ IDS HR Study 901 of September 2009, and the ‘Hours and holidays 2010’, IDS HR Study 926 of September 2010 (using Questions 1 and 3, plus sectoral data). The IDS figures are based on a database of information from 363 organisations and industry agreements. The data in Figure 2 should be read in conjunction with the following notes. Belgium – At the sector level the rule is 38 hours (following the general statutory rules). However, company agreements dominate in this sector – especially in relation to working time regimes. These agreements organise the annualisation of working hours (the conversion of weekly hours into annual working hours) and the link with the widely applied shift work and night work. Belgium’s big chemical companies will most of the time have a shorter working time arrangement. Examples exist of 33.5 hours as an average working week. No general overview exists of these company practices. Bulgaria – Working time in the industry is not based on collective agreements but it is regulated by two legal documents – Decree 267 from 2005 and the Labour Code. These stipulate 35 hours per week for hazardous occupations and jobs with hard working conditions, and 40 hours for all other occupations. Source: Trade Union Federation ‘Metalicy’. Finland – figure corresponds to collectively agreed normal weekly working hours in metalworking in 2010. France – according to an Acemo survey, the average of weekly working time was 35.62 hours in December 2010 and 35.69 in December 2009. Germany – Source: Collective Bargaining Archive of the WSI; the national average breaks down to 35 hours in western Germany and 38 ineastern Germany. Hungary – hours are lower in hazardous jobs. Luxembourg – figure is an estimate from the Luxembourg Confederation of Independent Trade Unions (OGB-L), referring to 2008. Malta – figure is an estimate calculated by the national correspondent. Netherlands – figure is an estimate calculated from the yearly amount of hours collectively agreed. Portugal – figure is based on collective agreements signed by the major metalworking trade unions (collective agreements signed by the Federation of Metalworking, Chemical, Pharmaceutical, Electrical, Energy and Mining Unions (Fiequimetal), and National Industry and Energy Trade Union (Sindel). Slovakia – Figure refers to workers in single-shift working time arrangements. Data on working time are from ISWC surveys conducted by Trexima Ltd.
Spain – calculated from the Ministry of Labour and Immigration’s collective bargaining statistics on average agreed annual working hours for the industry sector (including sectors with NACE codes 24 to 30); on average, these were 1,726.81 hours in 2009 and 1,707.81 hours in 2010, on the assumption of a six-day week and 274 working days a year. The average collectively agreed working week in 2009 was 37.84 hours. UK – figure from IDS is the average of (mainly company-level) agreements and refers to ‘engineering’; the figure for 2009 was 37.6 hours. The data in Figure 3 should be read in conjunction with the following notes. Belgium – figure is an estimate based on the provisions of various subsectoral agreements. Czech Republic – the figure, from the ISWC, refers to hours set by company-level collective agreements, the more prevalent bargaining level. Finland – the collectively agreed normal working week in banking in 2010 was 37 hours. France – according to the Acemo survey, the average working week was 35.14 hours as at December 2010 (as against 35.09 hours in December 2009). Luxembourg – figure from OGB-L; while a 40-hour week is generally the case, some companies may have an agreed week of 39.5 hours. Malta – figure is an estimate based on most collective agreements. Netherlands – figure is an estimate calculated from the yearly number of hours collectively agreed. Portugal – figure is based on collective agreements signed by the Banking Trade Union of the South and Islands (SBSI), affiliated to the General Workers’ (UGT). Romania - as set by the ‘Unique collective agreement at national level for 2007–2010’, the tripartite national collective agreement, which provides the basic framework for employment conditions. Slovakia – figure refers to workers in single-shift working time arrangements; Data on working time are according to ISWC surveys conducted by Trexima Ltd.
Spain – calculated on basis of 1610.22 as average annual working hours, on the assumption of a six-day week and 274 working days per year; source: Ministry of Labour and Immigration. UK – figure from Incomes Data Services, IDS, is an average of (company-level) agreements and refer to ‘finance’. The data in Figure 4 should be read in conjunction with the following notes. Austria – this is the usual figure for local government employees; working time is fixed by law or decrees. Belgium – figure corresponds to the general, statutory rule in the public sector. Cyprus – figure is from the Pancyprian Public Employees Trade Union (PASYDY). Czech Republic – figure is set by labour law: 40 hours per week, with the exception of workers younger than 18 years, whose working time is 30 hours per week. Germany – figure is from the Collective Agreement Archive of the WSI and applies to western Germany; the figure for eastern Germany was 40 hours. Malta – figure refers to working hours set by collective agreement for clerical workers in local councils. Portugal – there is no collective bargaining in local government; there are negotiations at the level of the public administration as a whole, but the government decides unilaterally on wages and working conditions (35 hours per week in both 2009 and 2010). Sweden – local government workers performing night or weekend work have shorter weekly working hours. UK – figure is from IDS; it corresponds to national agreements for local government employees in England, Wales and Scotland. The data in Figure 7 should be read in conjunction with the following notes. Czech Republic – extension of leave by a certain number of days or weeks is negotiated in collective agreements; in 2010, more than 76% of collective agreements included an extension of the entitlement by one week – therefore, five weeks in total. Estonia – as set by law, expressed as 28 calendar days; according to the Confederation of Estonian Trade Unions (EAKL) and the Estonian Employees’ Unions’ Confederation (TALO), some collective agreements provide for annual paid leave of between three and five days above the statutory level, but there are no data on the number of such agreements. France – as set by law, expressed as 30 working days, including Saturdays; increases with years of service. Greece – estimate of the EIRO correspondent; there is a range of entitlements, which vary from 20 to 25 days, depending on years of service. Italy – figure calculated as four weeks’ leave, plus one or two weeks’ reduction in annual working hours established through collective bargaining. Netherlands – figure is an estimate; both younger and older employees are usually entitled to more days and in many sectors employees are entitled to so-called roster-free days (in the metal sectors, for example, these can amount to 13 days). Romania – figure is the minimum laid down in the national collective agreement; it increases with service. Slovakia – figure is an estimate, based on the fact that (according to the ISWC), on average, 5.1 days more than the statutory minimum were agreed in 22.3% of surveyed companies for 2010. The data in Table 3 should be read in conjunction with the following notes. Austria – expressed as 30 working days, including Saturdays, and increases by five days after 25 years’ service. Belgium – figure refers to the private sector; minimum statutory entitlement in the public sector is 24 days. Bulgaria – higher statutory entitlements apply to such groups of workers as young and disabled people, and workers in hazardous work or working irregular hours. Czech Republic – expressed as four weeks. Estonia – expressed as 28 calendar days. Finland – entitlement is two days’ leave (including Saturdays) per calendar month worked in the first year of the employment relationship, and 2.5 days per month thereafter. France – expressed as 30 working days or five weeks. Germany – expressed as 24 working days (that is, Monday to Saturday). Greece – 24 working days for those working a six-day week; entitlement increases after one year’s service. Italy – expressed as four weeks. Latvia – expressed as four calendar weeks. Lithuania – expressed as 28 calendar days; certain groups, such as lone parents and people with disabilities, have an entitlement of 35 calendar days. Malta – expressed as four working weeks and four working days. Poland – entitlement rises from 20 days to 26 days after 10 years of employment. Slovakia – expressed as four weeks. Slovenia – expressed as four weeks; older workers, workers with disabilities and those taking care of disabled children are entitled to at least three additional days, and workers under the age of 18 are entitled to seven additional working days; leave entitlement increases for parents by one day a year for each child under the age of 15. Malta – expressed as 30 calendar days. UK – since April 2009, the statutory entitlement includes eight public holidays. The data in Table 4 should be read in conjunction with the following notes. Germany – figures are from the Collective Agreement Archive of the WSI. Italy – data are from Bank of Italy (Banca d’Italia). Romania – figures are EIRO correspondents’ estimates, according with the provisions of the national collective agreement and the collective agreements concluded at sectoral level. Spain – figures are labour statistics from the Ministry of Labour and Immigration; provisional in 2010.